ANYWAY. Hubby helped me get everything cleaned up & i started over. It was wonderful. 1) Preheat oil in a 4- to 6-quart Dutch oven or soup pot. Add tortilla pieces to hot oil. Cook & stir until brown, remove & set aside. Add ground beef, onion, bell pepper, & garlic to Dutch Oven. Cook until beef is brown. Drain off fat. 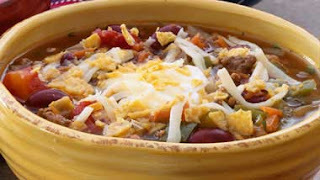 2) Stir browned tortillas, undrained tomatoes, water, undrained red beans, black beans, undrained hominy (or the corn), chile peppers, olives, & taco seasoning mix into Dutch Oven. Bring to boiling. Turn heat to low. Simmer, uncovered, for about 20 minutes, stirring occasionally. Add cheese & corn chips, if desired. *I didn't use the green chiles, because the diced tomatoes i got included green chiles. However it was still WAY TOO SPICY! Other than that it was really good! Plan Ahead - Prepare up to 4 days ahead. Cover & refrigerate. Reheat over medium heat until hot & bubbly. Freeze Ahead - Place cooked soup in freezer bag & freeze up to 2 months. Defrost completely in refrigerator. Reheat over medium heat until hot & bubbly. ANYWAY - hope you enjoy the soup! Oh honey I am so sorry! I got meat out of the fridge a few days ago that was still frozen too, but nothing like what you experienced. I don't know anything about the Dutch Oven, sorry. And ssssoooo sad your soup went down the drain. At least it didn't go on the floor!!!! Oh no! That it so sad that the soup went down the drain! I probably would have cried, thrown a mini tantrum and left it all for Mike to clean up hahaha. That's just how I deal. That recipe looks amazing. I am so excited to try it out! Sorry it started out rough...You poor thing! But you did a great job and it looks yummo! Happy Thanksgiving! !